On 24 March, 1945, the 6th Airborne Division dropped on the east side of the Rhine River as part of "Operation Varsity", the airborne component of "Operation Plunder', the invasion of Germany, ahead of the amphibious forces crossing the Rhine by boat and amphibious craft. 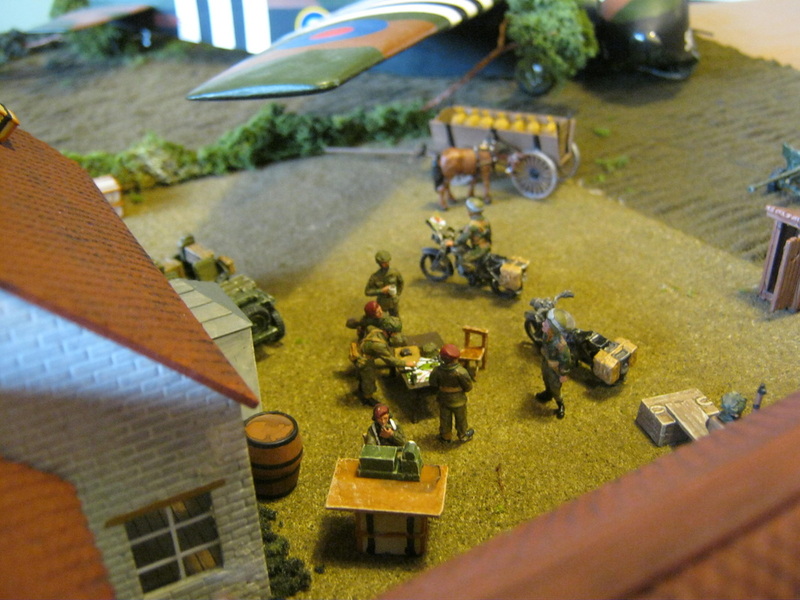 The scenes of Operation Varsity are being recreated in this diorama built in four parts, each 2' x 2' square, that can be easily transported for display at air shows and historic events for the general public. 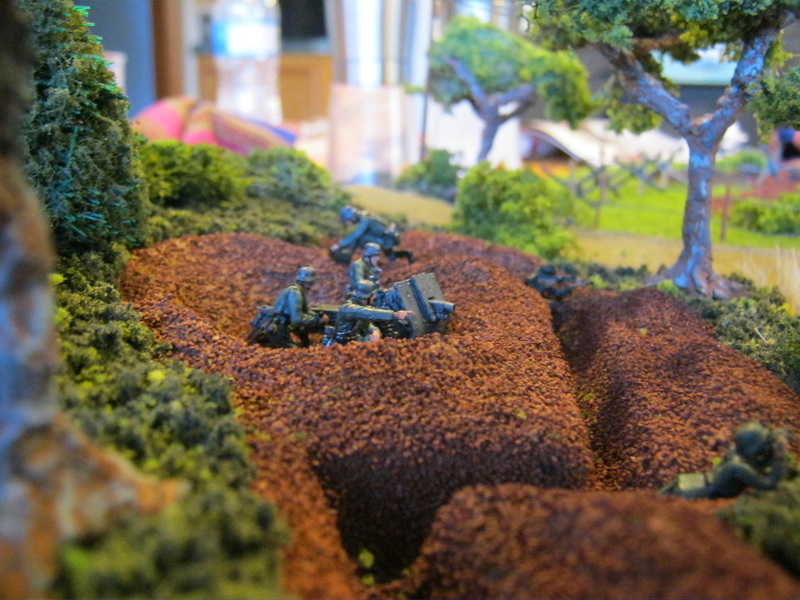 The completed diorama will be 2' wide by 8' long, and will be displayed with a description of the events taking place on the diorama to tell the story of the battle. 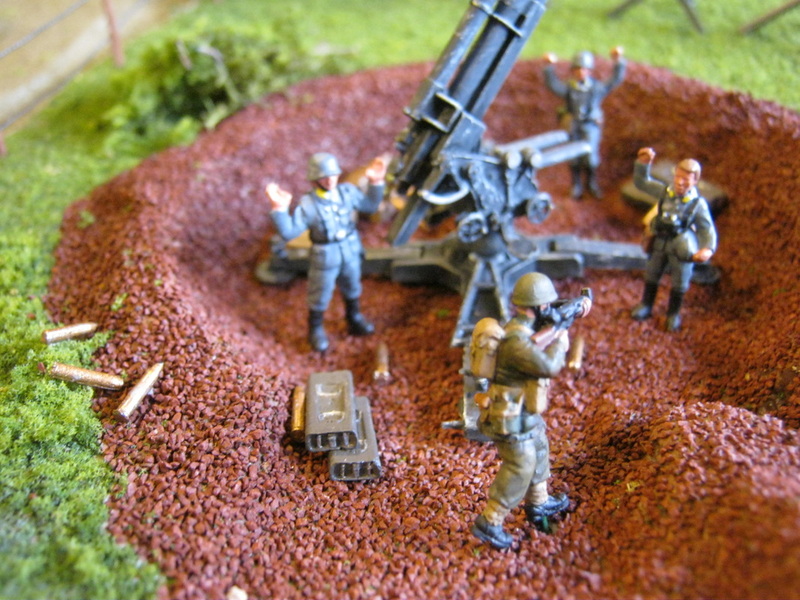 The first two parts of the diorama are now complete, and are shown in the photos below, and as the second two parts are completed, they will also be displayed here. 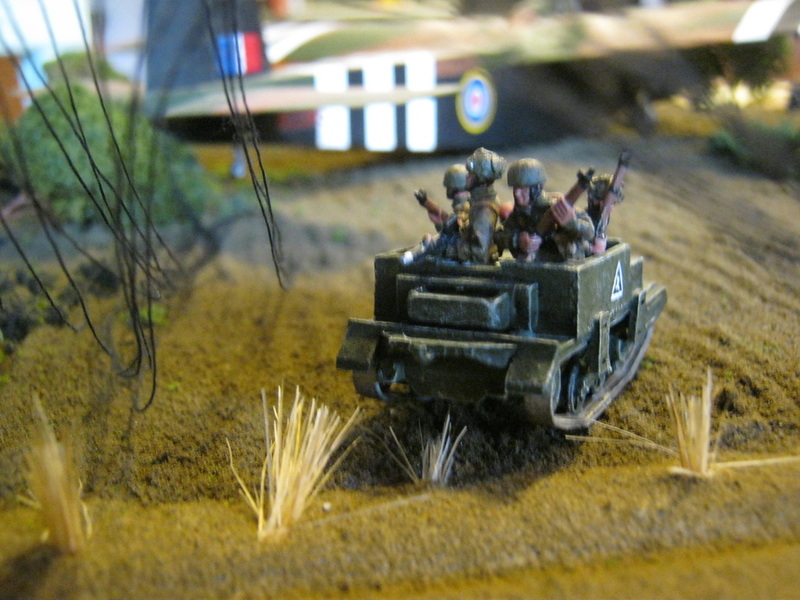 The diorama is designed to show as many of the components of the 6th Airborne Division possible, including the infantry, artillery, supply, medical, signals, headquarters and other elements, and in particular, the tanks of the 6th Airborne Armoured Reconnaissance Regiment. 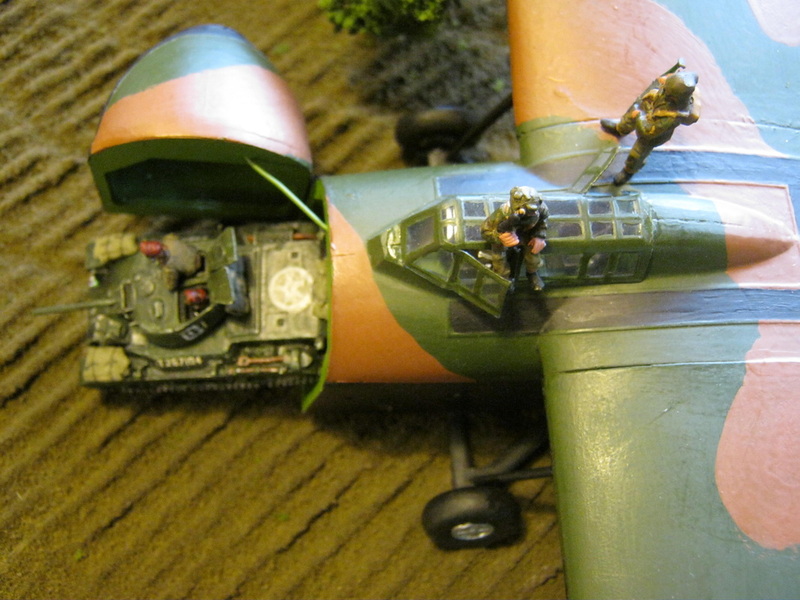 Top left to right: 6th AARR disembarking from its Hamilcar glider while the glider pilots exit the cockpit and prepare for battle. Tanks of 6th AARR and infantry of the 12th Devons at the railway embankment attack the german howitzer battery and infantry defending the Diersfordterwald. Center left and right: German light howitzer battery and infantry on the Diersfordterwald, shelling the 6th Airborne Division HQ seen in the distance at Kopenhof Farm. 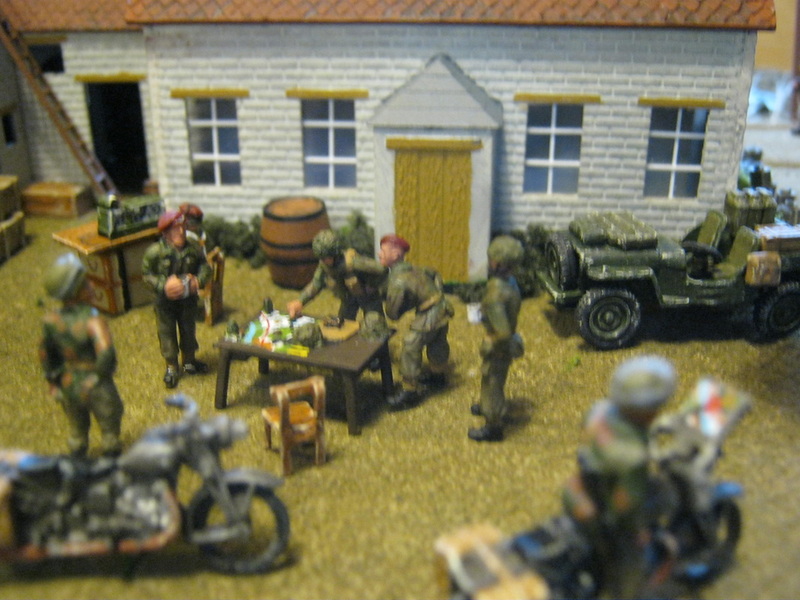 Bottom left to right: 6th Airborne Division at Kopenhof Farm. Officers, signalers, and dispatch riders form the brain and nervous system of the division. 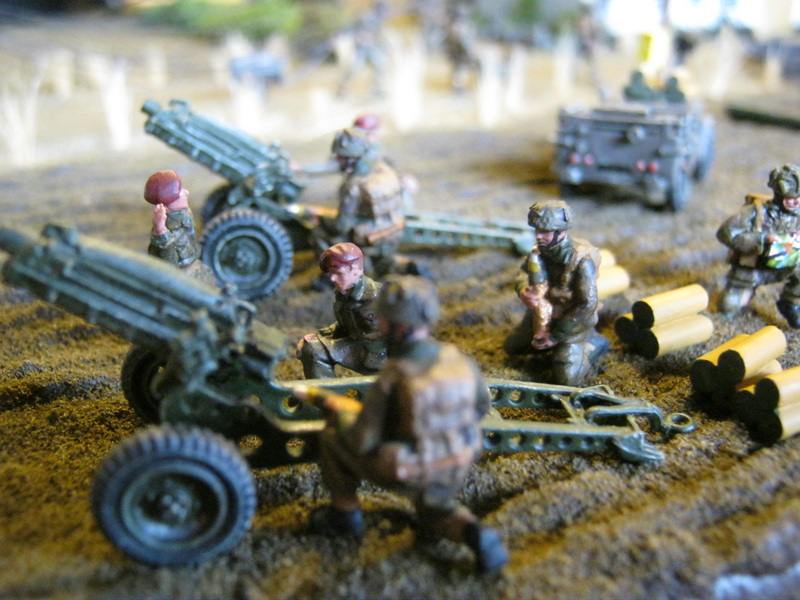 Gunners of the 211th Airlanding Light Battery go into action. 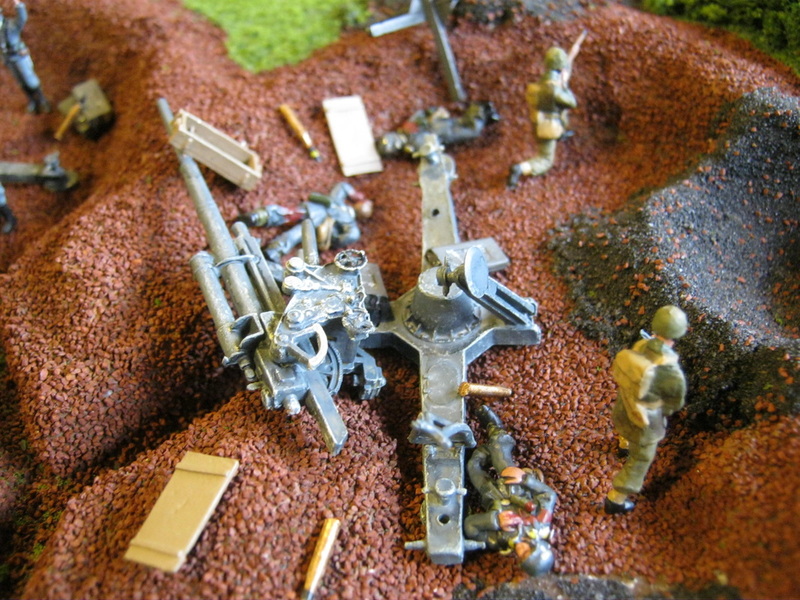 Top left to right: Critical to the success of the mission was the destruction of the flak batteries around the landing zones. Here what has not been destroyed by bombardment is over-run by the paratroops. 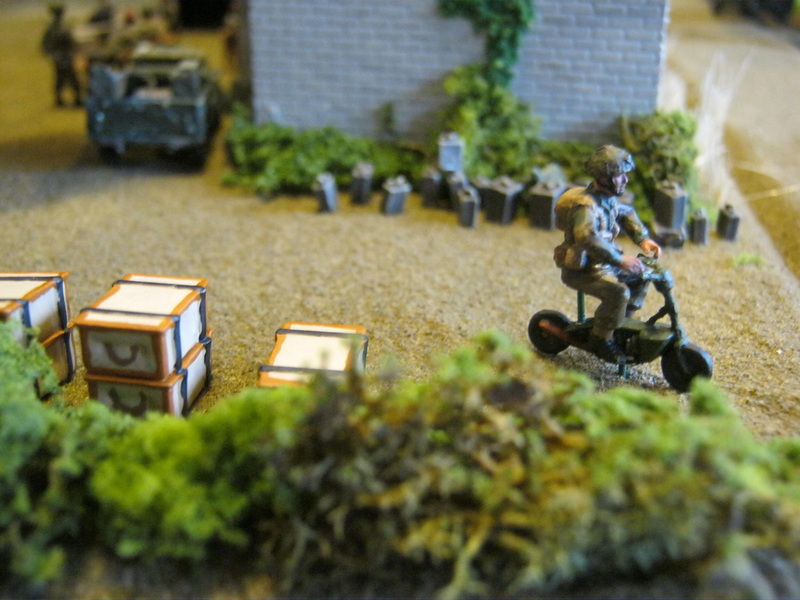 Center left and right: A messenger on a Welbike leaves the supply dump being assembled at Kopenhof. Panniers and fuel cans are collected from the drop zones. 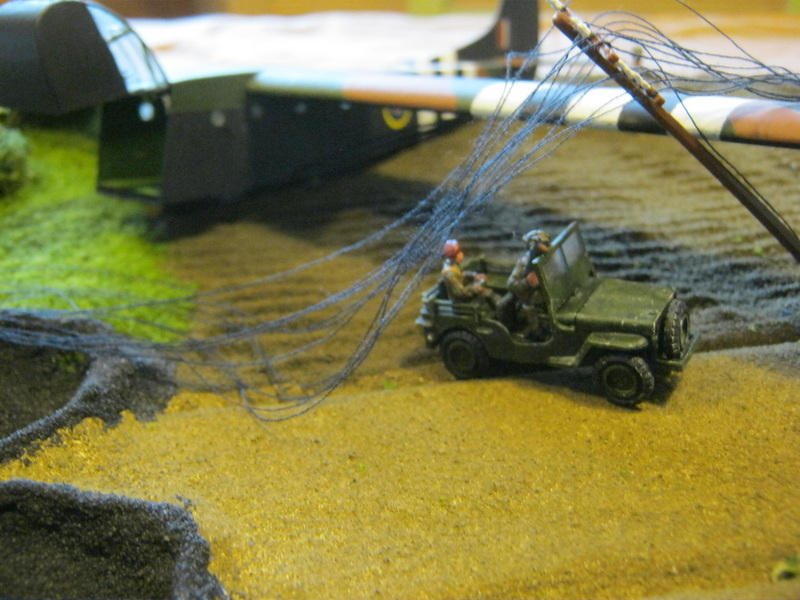 A jeep, having just left its Hadrian glider, heads for its assemply point. 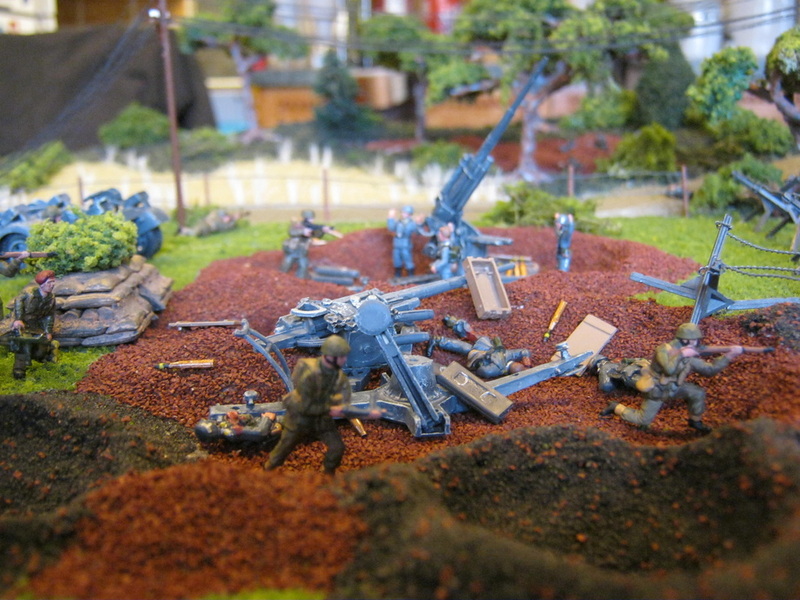 Bottom left to right: Another gun on the move toward its battery firing position. 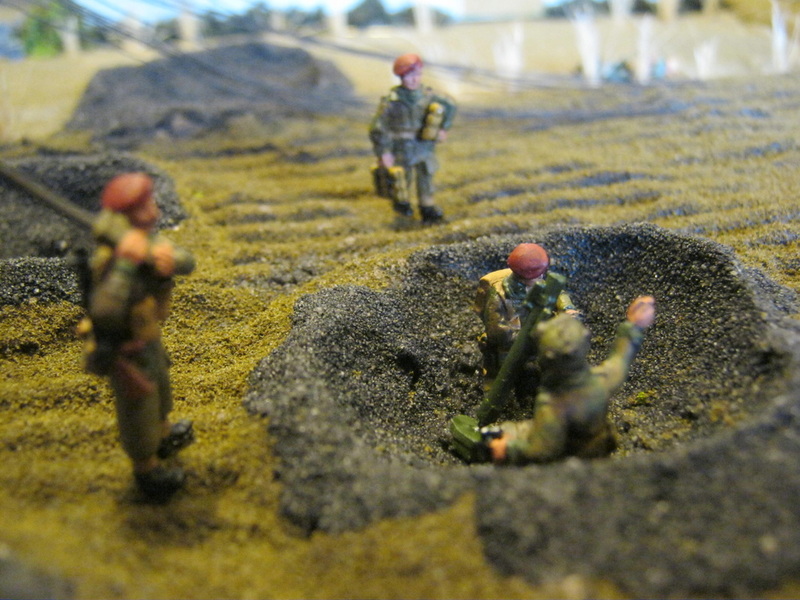 A 3" mortar and crew fires from a bomb crater. 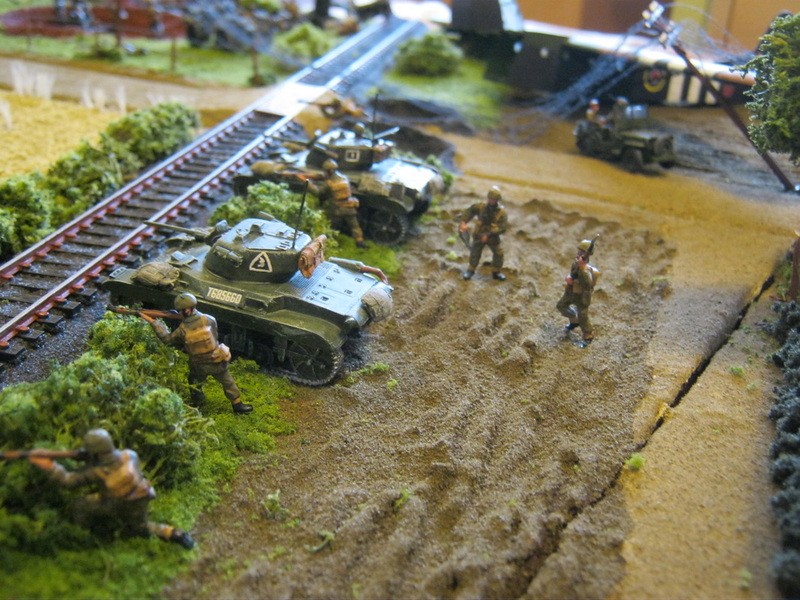 A carrier from 6th Airlanding Brigade moves troops quickly across the landing zones under fire.